When it comes to business, there are times where privacy matters. While often necessary, discussing certain things out in the open may seem uncouth. Meeting rooms allow for open discussion without the rest of the world peering behind the curtain. Exposing all the moving pieces that, well, spoil an organisations carefully crafted branding. Utilising every mind at your disposal is a priceless commodity which can only come about through collaboration. Whether it be giving your own team the space to get creative, or having a meeting of minds from others in the industry, working together helps discover ideas that may not have otherwise surfaced. New ideas getting you further faster only confirms that team work makes the dream work. One of the increasingly common aspects of modern business practice involves working remotely due to the technologically connected global marketplace. A space to set up your video conferencing equipment is perfect for bringing the whole team together, no matter where they may be in the moment. A well furnished meeting space with the perks of modern equipment can convey the foresight and attention to detail you pride yourself on in other areas of your business. 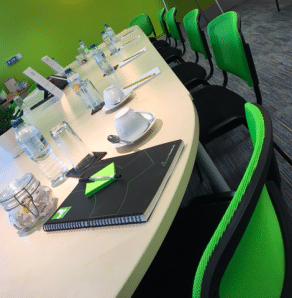 Meeting current and prospective clients within a professionally managed space puts them in a welcoming atmosphere to easily place their confidence in you.